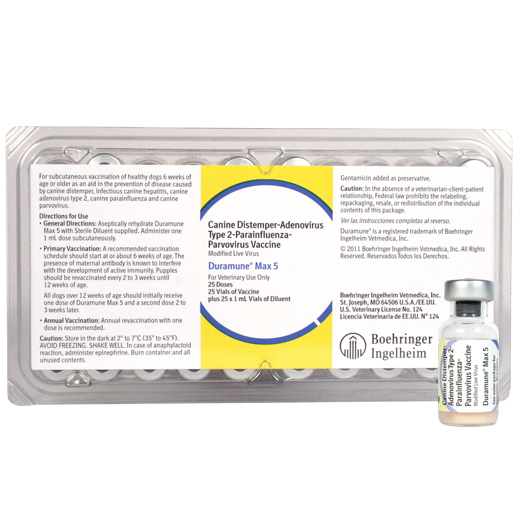 Boehringer Ingelheim Duramune Max 5 is effective in preventing canine distemper, canine hepatitis, adenovirus cough (kennel cough), parainfluenza, and parvovirus. The parvovirus portion is modified live canine cell origin. Canine adenovirus-2 (CAV-2) helps provide protection against both canine infectious hepatitis and tracheobronchitis (kennel cough). Good for puppies and adult dogs, small or large breeds. For vaccination of healthy dogs 6 weeks of age or older.